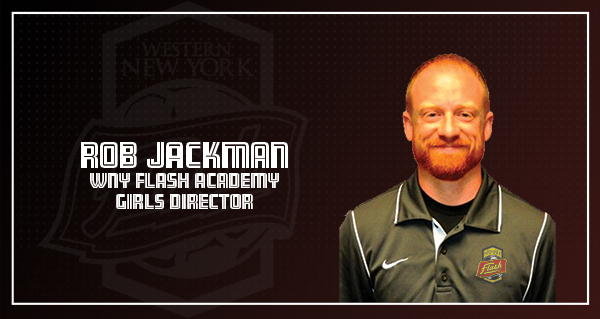 BUFFALO, NY (June 5, 2018) --- The Western New York Flash Academy is pleased to announce that Rob Jackman has been named the Academy’s Girls Program Director. Jackman joins the Academy after most recently working with Niagara University women’s soccer program and Empire United Development Academy. Jackman has been coaching in Western New York since 2005 at all levels of the game, from collegiate men and women to recreational leagues. With more than a decade of coaching and experience at the premier club level, he has worked with players that have gone on to play at NCAA Division I schools across the country, Region 1 ODP, ODP National Camps, and U.S. Soccer Training Centers. "This is an exciting new chapter in my coaching journey, and I can't wait to get started in my role as Girls Director for the Western New York Flash Academy,” Jackman said. “I am very dedicated to the development of soccer in our community and this is a great opportunity to affect female soccer players of all ages for the better in helping to create an environment where any young player with a desire and a work ethic can realize their full potential both on and off the field. Jackman boasts a USSF ‘B’ License and is working on receiving his ‘A’ License. He also holds a USSF National Youth License. Jackman spent a combined seven years coaching at Niagara University and Daemen College, along with 12 years at the club level. In addition, he has been a part of the NYSW Olympic Development Program and has been a part of the Region 1 ODP Camp Staff for the past five years. Jackman graduated from Buffalo State with a Bachelor’s Degree in Secondary Education in 2009. He was born and raised in Western New York and currently lives in Depew with his wife, Cristina, and two children, Claudia and Sam. "After speaking with Rob, Aaran, and Alex Sahlen, I could tell they had a clear vision to move the club forward and a great ambition to achieve their goals,” Jackman said. “The resources and support this organization provides are second-to-none, and I look forward to working diligently alongside everyone on staff to make the Western New York Flash Academy the very best it can be."